I have seen many people asking me how to verify facebook page.So today i have decided to share a complete guide on how to verify your facebook page. Facebook is one of the biggest and most trendy social networking site. There are many Peoples who use fb profiles or pages to promote their brand.I’ve seen some peoples who will charge money for getting your page verified.but i am sharing a Trick that will help you for free. Before we proceed we must know about what is Fb verified Page. You’ll see a blue badge next to a verified page or profile’s. This badge helps you to grasp you more followers and for those who find any profile or page using your brand name. 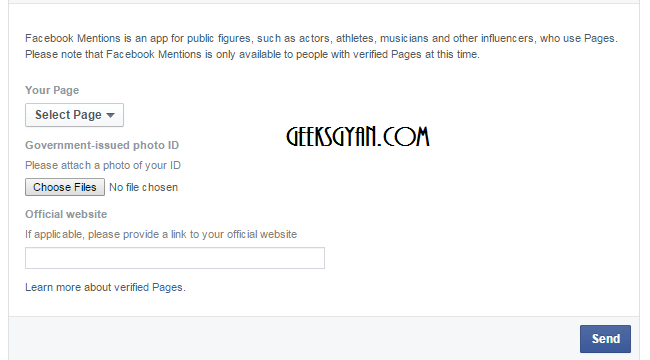 Eligiblity for facebook page/profile verification? 1) Celebrities,public figures or sports, media, politics and entertainment. 2) Global brands and businesses. Besides these all above categories local business pages are also easy to verify on facebook with very small verification process required if you are the Right representative of that corresponding business. 2.Now ‘Request A Verified Badge’ page will appear. Now Select the page you want to verify it. 3.Now,Just attach a photo of your ID . FROM Below list, you can submit any one of the proofs. Now If you have your official website then youmust also add your official website. In about section Add a short description about your website,Keywords about your company,Email,website,location with claimed business address and other details in Page Info tab . Now click on SEND button. NOw just wait for some days, Facebook will confirm your identity and if they found your ID Real they will verify it. How many days It will take to verify your Page? Note: It all depends upon your popularity as fb doesn’t provide any one hundred% garrantte to affirm your web page,but if you have provided Correct information then Facebook will definitely confirm your page within few days. *some of the blogs says that there is a minimum like criteria for verifying your blog.Don't believe on such things, I have personally seen many verified pages with too less likes such as 3000 likes,2000 likes,etc. *For more information regarding above topic, check the official FB help center page by clicking here. If you encounter any problem in the process,comment DOWN BELOW. Follow the same procedure which I discussed above. I'm not seeing my page as an option in the pulldown menu - neither of us two admins are seeing it.